I was sent a link to this talk by Google executive chairman Eric Schmidt (I mean the talk was by him, not that I was sent the link by him...) on the topic of disruptive technologies. He made some good points. He said that when it comes to new technologies there are so many of them that you really need to look at them with some kind of filter. I guess many people choose to find out about technologies based on how interested they are in them, but he said that there were just too many of these! So instead he suggested focusing on the ones that are likely to have a big impact - to be game-changers. Interestingly the first example he gave of these game-changer technologies was digital technology in biology. In one of my previous posts I mentioned medical uses of the iPhone and the advances in this area really blow me away. I've also mentioned that I work in an academic / health library for a college whose focus is natural medicine (think naturopathy, acupuncture, remedial and musculo-skeletal therapy, nutrition). What part is technology playing in these fields? It's sure to be a bigger part in the future than we think! On the topic of education, Schmidt thinks there is nothing more important. He pointed out that there's a great race taking place all around us, between humans and automation. Low-wage workers are losing their jobs to machines and what's the solution? Better education so that people can be paid for work with their minds, something a computer can not do. Machines are taking over automatic processes everywhere we look - Schmidt also gives the exampe of a Google product called Now which runs on your smart device and learns your habits, and can predict your needs. It knows your route to work and can alert you to traffic jams on that route at your travelling time! Computers are getting more intelligent, but the very human ability of judgement is needed and always will be. 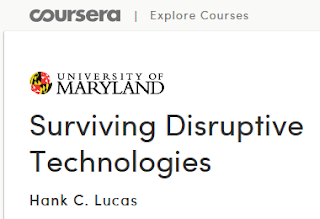 Still on the topic of education, I signed up to do my first Coursera course back in March and the topic was disruptive technologies. I'm sad to say I stopped participating after a few weeks, not because the course was bad, it was actually fascinating. I just ran out of speed. After seeing one of my tweeps post her certificate of accomplishment yesterday on Twitter, I feel fired up to tackle another one. There's a library MOOC starting in September. I'm going to do it, and I'm going to finish it (self pep-talk). It's all about emerging trends in library world and keeping up with them! Join me?